Analytics evaluate individual components of a course and evaluate student performance. Analytics takes a three-pronged approach to creating substantive data for Canvas users. Justification focuses on system reports and how the system is being used. Intervention looks to predict at-risk students and how to meet their needs. Learning focuses on learning outcomes, the effectiveness of the teaching style, and the division of time between students achieving competence and those falling behind. Account admins can see the analytics for the entire account to track and analyze what students, teachers, observers, and/or designers are doing within the account. Analytics work in conjunction with account Statistics. View a video about Analytics and Statistics. To view account analytics, analytics must be enabled in Account Settings. Account analytics also includes analytics enabled at the sub-account level. Analytics can be used at any level of the account, as long as the user has the account-level permission to view analytics. For example, admins in the root account  can view analytics for the account and all sub-accounts. Admins in sub-accounts  can view the analytics for their own sub-account and any additional sub-accounts below them. Admins can also view course analytics within an account or sub-account. Instructors can view course analytics if they are also given the analytics permission at the course level. When Would I Use Account Analytics? 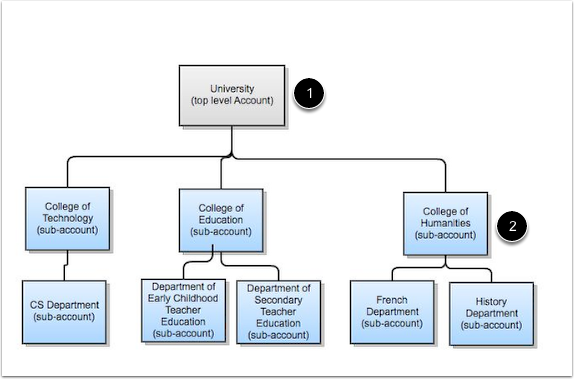 Overview of what is in the account including Courses, Teachers, Students, Assignments, Discussion Topics, Files Uploaded, and Media Recordings. Activity by date allows the Admin to view how everyone is participating in the courses within the term and account. 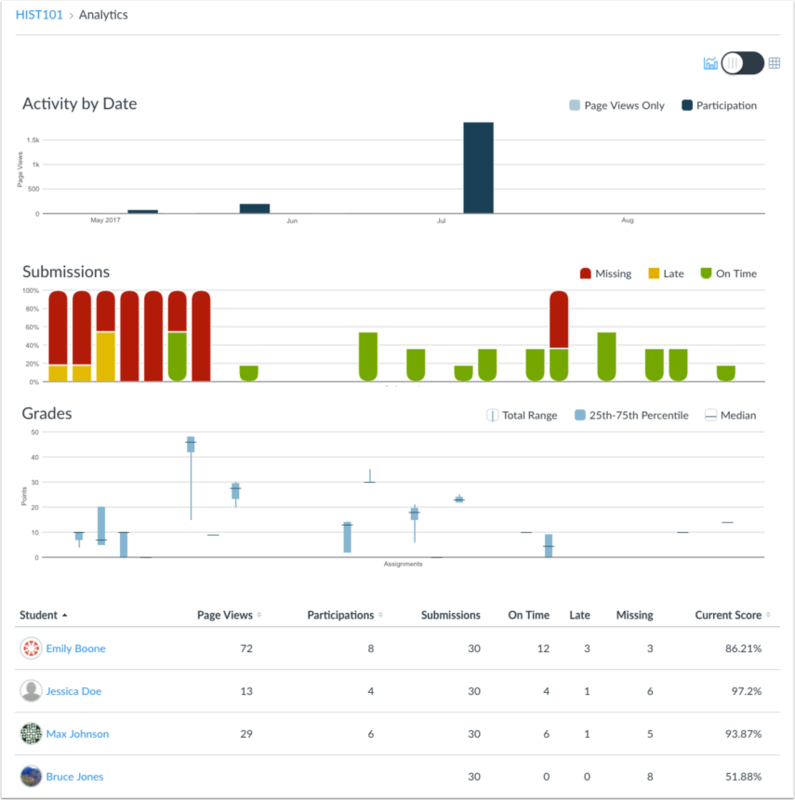 Activity by category allows the Admin to view the participation for Pages, Assignments, Modules, Discussions, Grades, Files, Collaborations, Announcements, Groups, Conferences, General, and Other. Grade distribution allows the Admin to view what the final grades and in progress grades look like during the term within the account. Make sure the students, teachers, observers, and/or designers are participating in the course. See an overview of the term within the account. View how the users are interacting with the courses in the term. Watch how the grade distribution fluctuates or stays steady. View the total number of courses, teachers, students, assignments, submissions, discussion topics and replies, files, and media recording in the term within the account. Instructors can see the analytics for a course to track and analyze what students, observers, and/or designers are doing within the course. Analytics work in conjunction with course statistics. Note: Viewing course analytics is a course permission. If you cannot view course analytics, your institution has restricted this feature. When Would I Use Course Analytics? Activity allows the instructor to see when students view a page or participate in the course. Submissions allows the instructor to view if students submit the assignment on-time, late, or not at all. Grades use a box and whisker plot to show the distribution of grades in the course. 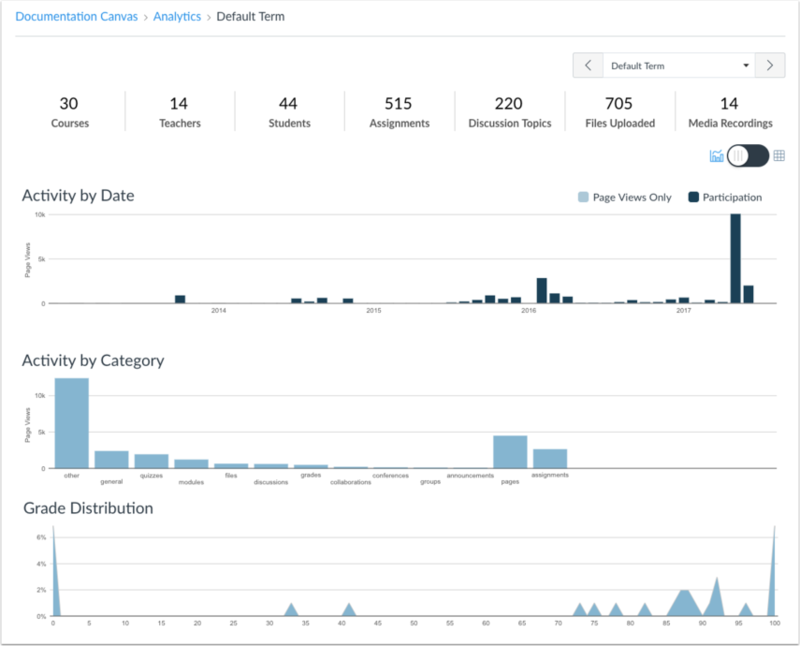 Student Analytics shows page view, participations, assignments, and current score for every student in the course. Predict how students react to course activities. See which students are at-risk and need help. View how effective your teaching strategies are in allowing students to learn. See a quick view of what your students are achieving in your course. Previous Topic:How do term dates, course dates, and section dates work in Canvas? Table of Contents > Canvas Features > What are Analytics?